Yikes! Some of you know what a creature of habit I am when it comes to crafting. I don't like trying new things because it scares me. However, today I stepped WAY out of my comfort zone and at least gave this new (to me) technique my best try. I can live with with the end result. I followed Lizzie's Sentiment Shadowing Tutorial on the new Papertrey Ink Blog, and tried to come up with something using this technique. I do like how the background turned out; so...thank you so much, Lizzie, for the stencil/ink background technique in the tutorial. I used a soft pink paper and followed Lizzie's tutorial to sponge and stencil my background. Then, I used her partial die-cut technique with PTI Flower Fusion #3 Die to create my sentiment banner. 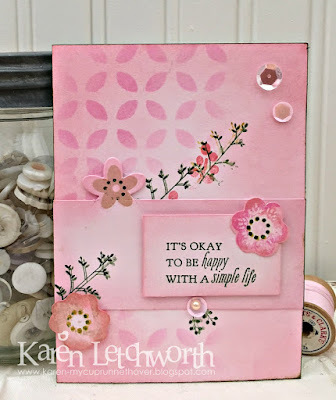 I used two Papertrey Ink stamp sets for my sentiment, flowers and limbs. One is the Twig Wreath Stamp Set and the other is the Bloomin' Cute Stamp Set. I also added a few sequins to accent my card. It's not spectacular by any means, but at least I can say I gave it a try. And for me, that's a big step. Papertrey Ink Blog - Make It Monday #310 - Lizzie's Sentiment Shadowing Technique - I used the following PTI products on my card: PTI Flower Fusion #3 Die - Twig Wreath Stamp Set - Bloomin' Cute Stamp Set. And as explained above, I tried! A2Z Scrapbooking Challenge - January - Something New - So, as I explained above, I used a brand new (to me) technique that's way out of my comfort zone. I also used my new inks. Words 2 Craft By - Challenge #49 - New Beginnings - I am trying new techniques this year, and as I explained above; this card represents just that. A new year, new beginnings, trying new things. Great challenge. Pretty card - you have so many pretty elements. I love the layout. Not spectacular - I beg to differ karen - this is beautiful!! Love the colours and the gorgeous stenciling behind the beautiful branch of flowers. Pretty pink card, Karen. and your shadowing and stenciling are beautiful. Lovely layout to a beautiful card! This is such a pretty card , Karen! Love the background you created! Awesome card, Karen! You did great stepping out of your usual style! Love the soft pink! Thanks for linking this up to the Cropstop blog this month! What a beautiful and cute card. Love the details and cute diecuts. Thanks for your entry in our challenge at Tuesday Throwdown. Happy Crafting! Hmm never thought you were a little scared to try something, first you did a beautiful card, it turned out perfect ! Glad I'm not alone in trying things I'd never done. Again great job. Very pretty card! I like everything about it! I think you did a GREAT job....It's hard to step out of your comfort zone sometimes! I really like how the background turned out, and the stamps you paired it up with work really well. Congrats on a great card! So glad you shared it with us at Tuesday Throwdown challenges! I love the sponging and stencil work a lot. It's so warm and comforting and lovely with the soft colors. Love it. So glad you joined us at A2Z Scrapbooking. What a beautifully feminine card...so pretty! Thank you for joining us at W2CB! Lovely card, so feminine and dreamy!! Thanks for playing along our New To Me challenge at a2z. Nice mix of techniques on one card, glad you entered at a2z!